My late grandma used to have a saying about how you can get to be as old as a cow and still learn new things. In German, the saying rhymes, so it makes more sense than in English, as cows don't get to be very old. Her point was, we are never done learning, and I often hear myself repeating her words in my head. Here's something I just figured out this week. Our family LOVES pesto. Not only that, but it's super quick to make if I need to make a meal in a pinch. It is also an inexpensive, vegetarian meal. If you like, the basil can be substituted with cilantro or parsley for a change of flavor. However, I much prefer my pesto over gnocchi than over just plain pasta. Gnocchi, while great for using up leftover potatoes, are very labor intensive, especially when making a large batch for lots of hungry people. 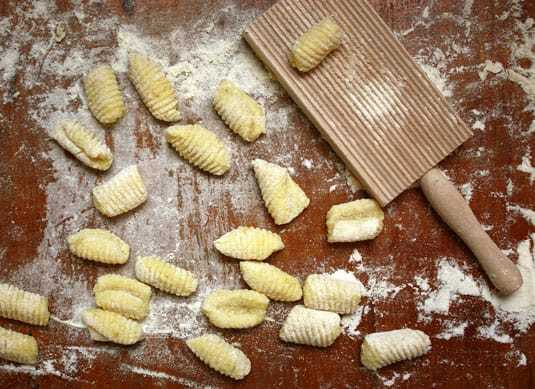 Traditionally, the dough for the gnocchi would be rolled out in small batches into ropes, which are then cut into smaller pieces, and pressed with a fork or special noodle board for the traditional look. Pretty, yes, but oh, so labor intensive. It finally occurred to me to instead just roll the entire batch of dough out on a large floured board, and then cut it with a pizza cutter into smaller pieces. SO MUCH quicker, though admittedly not as pretty. The taste, of course, was unaffected by this shortcut. If you have an Italian-born grandmother who makes the best gnocchi outside of Italy, this may not be what you want to serve for a holiday meal. But for an everyday quick lunch or dinner, it works wonderfully. If you like, you can read on below for more detailed instructions, and which recipes I used. Recipe for gnocchi is found here. I also add 1/4 tsp nutmeg per batch, triple the recipe, and use whatever leftover potatoes I have on hand. This time, it happened to be red potatoes that had been steamed with their skins, and then seasoned with parsley, salt, and butter. You can see both the skins and the parsley in the above batch of gnocchi. Russet potatoes work best, but I find the differences almost unnoticeable. Finally, you can use part or all whole wheat flour in place of the white - personally, I would do a maximum of half whole wheat, and half all-purpose flour. This time, I used all white flour. Recipe for pest is found here. Like I said, you can substitute cilantro or parsley for the basil. You can also use walnuts or pecans in place of the pine nuts. I didn't take a picture of making the dough. Usually, I start out by adding just the (cooked) potatoes to the mixing bowl of my KitchenAid, and mashing them by turning on the paddle attachment for a couple of minutes. Then I switch to the kneading hook, add the rest of the ingredients, and knead the dough until it just comes together in a ball. Turn the dough out onto a large floured board, knead a bit longer to make sure it is the right consistency, and then roll it out. Cut into thin strips using a pizza cutter. Then cut diagonally to make gnocchi. If you like, you can then go over them and smash them a bit with the back of a fork dipped in flour. In batches, plunge gnocchi into a large pot of boiling water with salt added. When gnocchi rise to the surface and have puffed up some (about 2 minutes), scoop out with a slotted spoon and allow to drain. Add all pesto ingredients to a blender; process until well combined. Serve gnocchi with parmesan cheese. If you have time, garlic bread and Caesar salad make perfect side dishes. I have never had that before, but it looks delicious. I think I will make that next week some time. Thanks for sharing! mmmmm this looks delicious. I am definitely going to have to try this. Thank you for the recipe. I love how you make things from scratch, as it is so rare these days. I am trying to get better at that myself. Thanks so much for this! I love gnocchi and have made it in the past but you are right, it takes so much work. I think my family may be having gnocchi with pesto for dinner this weekent! WOW! Gnocchi are among my favourite meals ever, I have an Italian grandmother. We do that in the family quite regularly. I'm not at all good at cooking, and quite frankly, I don't like it, but this tip is probably going to make me prepare gnocchi ! :) Thanks a lot.